Amazon.com description: Product Description: States reject inequality when they choose to ratify the International Covenant on Economic, Social and Cultural Rights (ICESCR), but to date the ICESCR has not yet figured prominently in the policy calculus behind States' international economic decisions. 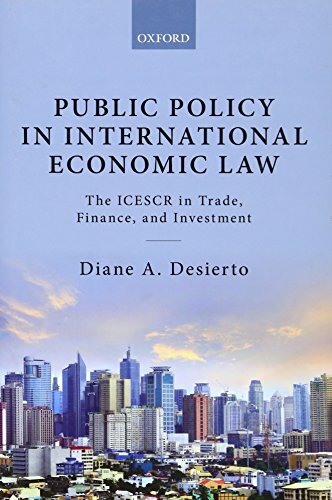 This book responds to the modern challenge of operationalizing the ICESCR, particularly in the context of States' decisions within international trade, finance, and investment. Differentiating between public policy mechanisms and institutional functional mandates in the international trade, finance, and investment systems, this book shows legal and policy gateways for States to feasibly translate their fundamental duties to respect, protect, and fulfil economic, social and cultural rights into their trade, finance, and investment commitments, agreements, and contracts. It approaches the problem of harmonizing social protection objectives under the ICESCR with a State's international economic treaty obligations, from the designing and interpreting international treaty texts, up to the institutional monitoring and empirical analysis of ICESCR compliance. In examining public policy options, the book takes into account around five decades of States' implementation of social protection commitments under the ICESCR; its normative evolution through the UN Committee on Economic, Social and Cultural Rights, and the Committee's expanded fact-finding and adjudicative competences under the Optional Protocol to the ICESCR; as well as the critical, dialectical, and deliberative roles of diverse functional interpretive communities within international trade, finance, and investment law. Ultimately, the book shoes how States' ICESCR commitments operate as the normative foundation of their trade, finance, and investment decisions. About: States reject inequality when they choose to ratify the International Covenant on Economic, Social and Cultural Rights (ICESCR), but to date the ICESCR has not yet figured prominently in the policy calculus behind States' international economic decisions.